Cordless doorbell with five different, specially composed, high quality polyphonic tunes. Additionally, it offers a special tune designed for the hard-of-hearing. Software and USB cable are included, so it can be connected to a computer and programmed to play both downloaded and self-composed jingles in the so-called MIDI format. A various range of melodies can be downloaded on free-midi.org. Light indicates both ring and low battery-level. One single chime can operate with an unlimited number of Bell pushes. Up to 5 doorbell buttons can be operated with different melodies indicating where your vistiors are ringing. 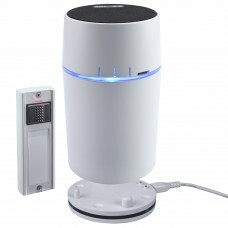 The Chime is designed to be wall mounted as well as free standing, enabling the user to bring it wherever it is needed. Operating distance of 656 feet (200 m) in open field. Protected from the interference of other cordless products. 1 push button and batteries included.